Over the last ten years, platforms have successfully emerged and are now dominating all industries — prime examples being Airbnb, Amazon, Netflix and Google. Platforms give ultimate control connecting buyers and sellers to create economies of scale on both the demand and supply side. Blockchain has proven effective in solving many problems associated with centralization; the canonical example being Bitcoin. Over the last couple of years, a range of distributed ledgers have emerged with similar missions — to use the benefits of peer-to-peer networks and techniques of decentralization to provide a system that can be trusted — 100%. 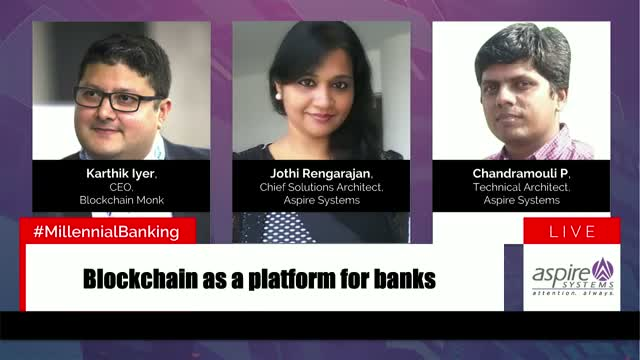 How can banks use blockchain as a platform to deliver personalized banking services? Aspire Systems welcomes you to the third session of the Millennial Banking Day. Millennials today are transforming the way banking is done. In a world where all other industries have started to serve their millennials at the speed and scale to keep them engaged, this puts a huge pressure on banks to innovate in such a way that millennials witness personalized banking experiences intuitively at the speed of light. Join us for a 45 minute Q&A session with best known experts from the fintech industry to discuss blockchain opportunities at banks and how effective their digital banking services can be made to address the heart of the blockchain use case: future-proofing the power of a smart digital ecosystem. Let’s just call it as it is! Netflix has a high-powered, customer centric AI model. The way Netflix uses Artificial Intelligence to give their customers accurate recommendations is nothing short of mind-blowing. Now, what if we told you that banks can be the Netflix of the Finance Industry by just adopting an advanced AI system? It’s true; banks can do so much more for their customers, with such little effort as long as Artificial Intelligence has your back! Tune in on April 24th, 2019 at 10:00 am CST to uncover all the tricks of the trade! Register Now! ServiceNow has released its Automated Test Framework (ATF) feature in last year’s Istanbul release. Ever since, it’s widely used by ServiceNow customers to create and run automated tests on their ServiceNow instance. In this webinar session, we will conduct an expert analysis on ATF, and find out how organizations are leveraging ATF to achieve ROI from their investment. We will also demo few use cases on ATF to help users navigate through this feature and learn the advantages of using it. This webinar is aimed at helping organizations understand on how to reduce the cost of quality through selective and incremental test automation and improve the ROI by driving the automation development based on not only the test coverage, but the business needs as well. Join Bhanuprakash Pichu, an experienced Test Automation consultant who has handled large scale Software Test Automation projects from Inception to Deployment, for this session on how retailers can gain the best out of Test Automation using a Digital Commerce quality automation framework. In grand finale of the webinar series ‘4 dimensions of DevOps’, we will conclude by discussing the importance of the fourth and final dimension – Orchestration and Feedback Loop. We would also offer the viewers an overview into our DevOps Template rule engine that has the ideologies embedded. These are the DevOps essentials that we follow in our projects to help us streamline the DevOps Pipeline and deliver high ROI to our customers. 1. Introduction to the fourth dimension – orchestration and feedback loop. 2. Why is it important and How does it affects the parameters of a developers requirement? 3. How Aspire's inference engine applies rules to arrive at a template for a given DevOps project. 4. Benefits of using this approach to help you make decisions faster and build products that meet your customer needs. Aspire and Sauce Labs are jointly conducting this webinar on the topic ‘Embedding Quality Engineering in DevOps Pipeline’. This webinar is aimed at helping organizations understand the importance of Continuous Testing in a DevOps environment and how it can be integrated with cloud environments. Does your traditional middleware platform hold back your enterprises’ digital goals? Well, you can’t blame it as it wasn’t really built to support today’s hybrid IT environment. To survive in the fast-paced data-driven economy, businesses should modernize their integration platform to be fast, flexible and cost-effective for delivering seamless customer experience, improving collaboration and innovation. In this webinar, we will help to prepare a digital strategy that would drive a systematic path of modernizing your integrations as API driven. This video will help retailers analyze their customers' shopping trends and create personalized offers based on their history of past purchases. Customer satisfaction and retention statistics will enable retailers to up-sell their products. Customers expect to be treated as valued individuals along their shopping journey. Retailers must focus on treating their customers’ right and showering them with personalized offers so that they walk out of the store satisfied. Satisfied customers tend to come back. Thus, this also improves Customer Retention. Watch the video to understand the Tableau dashboard to measure Customer Satisfaction and Retention. How to use Machine Learning for Customer Intelligence in the Fintech world? Customer behaviors in Asia Pacific economies with countries like China, Japan, Australia, Singapore, and South Korea have a tech-savvy client base, who demand a great digital banking experience, whereas on the other hand, countries with a low smartphone penetration demand face-to-face interactions. The main areas of improvement through ML & AI can be divided into three categories: enhanced client experience, new products & services, and improved internal services. This workshop will let you help you acquire customer intelligence techniques, the pre-requisites, key information and tools to help you build a customer driving lending business. • How do you make sense of customers’ data and predict the future of their financial needs? • How do you make your products more customized for your customers? • How do you identify your customer based who they are and not just with their ID? Save your spot for this AI & ML webinar that can help bring you up to speed on readily available use cases. Aspire is conducting this webinar on the topic ‘Optimizing Cost of Quality through Incremental Test Automation’. This webinar is aimed at helping organizations understand the importance of measuring cost of quality and reducing cost of poor quality using incremental test automation. Customer Intelligence helps retailers create an ideal customer proﬁle, predict their wants and dislikes and engage customers at an emotional level. It also gives a better insight into the customer persona thus enabling improved targeted marketing and better analysis of customer complaints. Let’s look at some of the features that Oracle Fusion offers and that Sage/QuickBooks does not. This webinar will help you get a clear picture as to why Oracle Fusion is more feature-rich when compared to Sage and QuickBooks. •What are the benefits of moving Oracle Fusion? •What is Modern Finance and the best practices in Finance? As the holiday season is fast approaching, the retailers by now must have formulated their game plan to attract new customers and win business. But in order to beat today’s competition along with shorter attention spans, retailer's need to reinvent their game plan. Register for the webinar and learn how retailers can leverage on Artificial Intelligence to win customers and their competitors. In part-4 of the DevOps webinar series, we are discussing the topic ‘Release Management and Continuous Integration’. Release management is almost always the overarching concern in any organization. DevOps plays an important role in enabling a robust release process that is both quicker and mindful of quality. In this episode of the webinar series, we take a deep dive into release management and suggest ways to apply a templated approach to the release management process. • Post Release aspects such as Archival Strategy, Cleanup, Upgrade planning and scheduling, etc. This short 20-min webcast demonstrates how we have automated user creation in AD using ServiceNow orchestration module. In this video, you will be able to learn 3 use cases where user creation in AD is automated through different service request inputs. Aspire Systems is a bronze services partner and a global solution provider of ServiceNow, we are helping our customers implement, enhance, and manage the NOW platform in an efficient and simplified way. This ITOM webcast series will cover topics and use cases that are overlooked but can easily be automated using the NOW platform, to help the IT team reduce their manual workload. For personalized demonstration and PoC, please contact us at info@aspiresys.com. Customer onboarding and origination is the most important engagement for banks. Tech savvy customers tend to open bank accounts from any device. Aspire’s Customer Onboarding Plug n Play built for Temenos Digital Banking Channel users curbs attrition rates and reduces average onboarding time. Here is a quick demo of Customer Onboarding Plug n Play solution accelerator. This part 3 of the webinar series, “4 Dimensions of DevOps” focuses on applying a templated approach to continuous testing and brings out the importance of continuous testing in an agile paced DevOps environment. Designing and developing a user-friendly Service Portal or Self-service portal tops the to-do charts of any IT Service Management leader. But enabling the end-user to use the service portal effectively is a herculean task and that’s where most organizations fail. In this knowledge session, our ServiceNow experts will demonstrate how to build an easy-to-use service portal and achieve your organization’s IT Service Management goals. Aspire Systems is a global technology services firm serving as a trusted technology partner for its customers. The company works with some of the world's most innovative enterprises and independent software vendors, helping them leverage technology and outsourcing in Aspire’s specific areas of expertise. Aspire System’s services include Product Engineering, Enterprise Solutions, Independent Testing Services and IT Infrastructure & Application Support Services. The company currently has over 1,400 employees and over 100 customers globally. The company has a growing presence in the US, UK, APAC, Middle East and Europe. For the 6th time in a row, Aspire has been selected as one of India’s ‘Best Companies to Work For’ by the Great Place to Work® Institute, in partnership with The Economic Times.